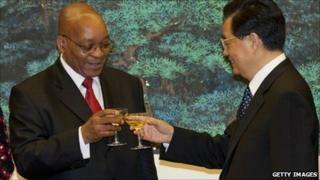 Will Brics strengthen South Africa's economic foundations? The Bric grouping of major emerging economies - Brazil, Russia, India and China - is turning itself into the Brics. And the new "S" - South Africa - clearly sees it as a significant foreign policy success as well as recognition of its economic strength and potential. China issued the invitation as it is currently chairing what is more of a forum than a formal organisation, and a spokesman for the South African Department of International Relations and Co-operation said this followed consultations among the Bric nations over a period of time. South Africa will attend the next meeting, expected to take place around April. The Chinese government has said it believes South Africa's accession will "promote the development of Bric and enhance co-operation between emerging economies". South Africa has been keen to join this particular economic club for some time, and President Jacob Zuma has visited all four countries since he became South African leader less than two years ago. Although South Africa has the largest economy in Africa and joining Bric could be seen as a further sign of the growing links between the nations of the global South, South Africa's economy is still far smaller than the economies of the other four nations. There are challenges for South Africa in lining up with the founding Bric nations, and analysts say these include how successfully South Africa can make itself more attractive for investment. And it has seen only a brief growth spurt of more than 5% - well behind China and India in particular. "It is not clear how South Africa fits very easily into the Bric group," says Razia Khan, Head of Africa Research at Standard Chartered. "And besides the size of its economy and its rate of growth, the most controversial aspect is South Africa's share of global GDP compared with the others," Ms Khan told the BBC. Some analysts have suggested that this could distort a grouping of nations which have been making an ever greater impact on the economic landscape over the past decade - contributing over a third of world GDP growth. But the South African government says the gap between the size of its economy and the others has not been an issue in the consultations over entering Bric. What China above all - but also India, Brazil and Russia - are interested in is South Africa as an engine for development and a gateway for investment in Africa as a whole. South Africa is today China's biggest trading and economic power in the continent, and Beijing's ambition for its relationship with Africa appears to be boundless. Trade between Africa and China has trebled in the last decade and recent reports in the official Chinese media say it stood at $115 billion (£74 billion) at the end of November. Raw materials that are plentiful in Africa have been a crucial source of China's own spectacular growth while China is playing a key role in Africa's own economic development, particularly in infrastructure projects. If India - with its own important historical association with Africa - was initially taken by surprise by the scale of China's interest in Africa it has been playing catch-up in a major way, too. There are challenges for South Africa in lining up with the founding Bric nations, and analysts say these include how successfully South Africa can make itself more attractive for investment. In theory at least, this new status should help. Ms Khan says it suits South Africa's geo-political ambitions, adding to its prominent role in the Non-Aligned Movement and the fact that it is the only African country in the G20 group of nations. The symbolism of this move could well turn out to be as significant as the pragmatic economics - as another step in the re-ordering of global relationships and partnership. However, with other emerging economies such as Indonesia's and Mexico's also waiting in the wings, some question whether there could soon be so many Brics that the forum loses influence. South Africa's entry though, one analyst has said, is about projecting Africa as "the frontier market" that it is.